Need to integrate data related to your systems, and to analyze and utilize the data from a variety of perspectives? With JP1/Integrated Management 2 - Manager, you can manage, in an integrated manner, the events occurring in your systems, along with various types of data and the relationships in the data. This in turn allows you to utilize the data efficiently and to provide users with the data they need, when they need it. This product helps you collect all of the information you might need when making business decisions, such as data on system configurations, the status of business operations, the operating status of applications, and information about KPIs and costs. Based on expert knowledge, you can then define and graphically display relationships in the collected data. By accumulating knowledge and expertise in the form of data, JP1/Integrated Management 2 helps you achieve system operations that do not rely on specific operators. JP1/Integrated Management 2 enables operators in different positions and with different roles to easily check the data they need, without having to be aware of factors such as the location of the data, the interface used to obtain the data, or the configuration or relationality of the data. As a result, decisions regarding the priority with which events are to be handled can be made from the perspectives of business and service, and the various parties involved in the handling of events can assess the situation and share information more quickly. In this way, JP1/Integrated Management 2 achieves intelligent IT operations, helping you make full use of the data related to your systems. JP1/Integrated Management 2 allows you to define and visualize the relationships in collected data based on the expert knowledge of engineers. Such knowledge includes the knowledge that a business systems administrator might have about the relationships between different business operations, and the knowledge that an infrastructure administrator might have about the relationships between servers and applications. Accumulating specialists' expertise in this way makes it easier for the administrators and operators responsible for system operations to share and utilize knowledge, thereby eliminating dependence on any single person (such as an administrator or engineer). 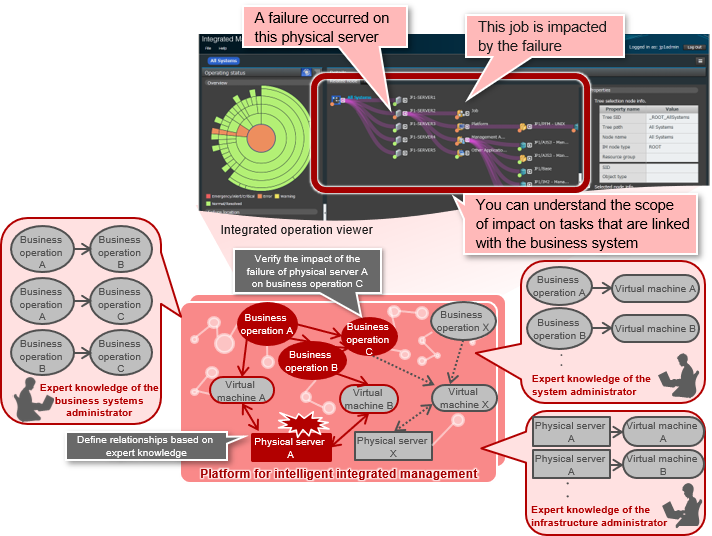 By using accumulated knowledge about the relationships in your data, you can see how a failure on, for example, physical server A impacts not only business operation A, but also business operations B and C.
With JP1/Integrated Management 2, you can gain an understanding of the relationships among your systems and visually check the status of your systems as a whole. You can also instantly identify connections between processes executed across multiple systems, as well as the order in which such processes are executed, allowing you to quickly determine the scope of impact of failures that occur. For a series of connected operations (jobnets) executed by different instances of JP1/Automatic Job Management System 3, you can use JP1/Integrated Management 2 to keep track of the connections between such jobnets, as well as the execution statuses of all jobnets running in your systems. Having an understanding of the connections between jobnets linked across multiple systems and the order in which jobnets are executed allows you to determine the scope of impact of an event. For example, you can easily identify jobnets impacted by a failure or by changes made to the definition of a particular jobnet. This allows failures and definition changes to be handled promptly and efficiently. The REST API can be used to collect various types of data scattered throughout your system (including the statuses of business operations, the operating statuses of applications, and data registered in management tools). This allows users to easily check the information they need, without having to be aware of individual data structures or the interfaces involved, and thus molds the integrated management of IT systems to suit individual needs. By using a unified common interface (the REST API), you can create windows such as those for evaluating operations on a per-system basis and for monitoring systems according to the system blueprints that your system administrators are familiar with. 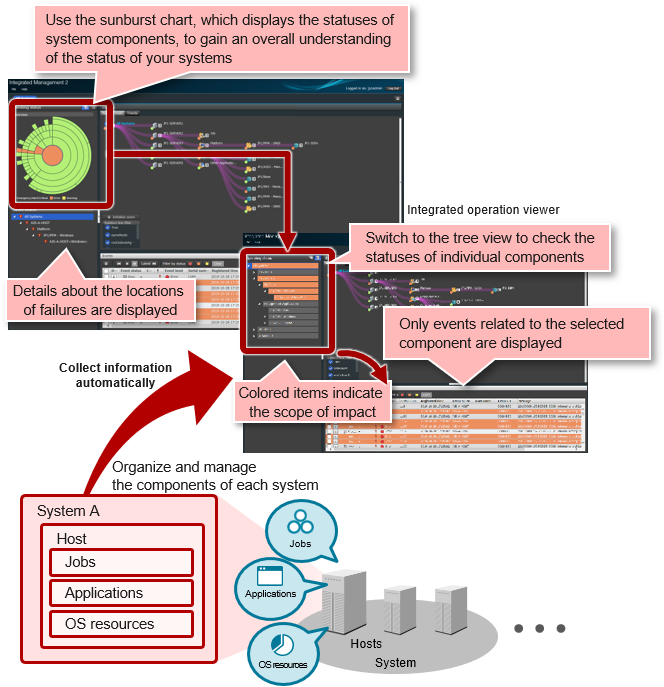 By graphically displaying all of the events occurring in the systems you manage, you can get an instant overview of the status of your systems as a whole, allowing you to easily check your systems' health. JP1 displays all of the information you need for monitoring (such as information about important events that have yet to be handled) on a single screen, helping reduce the workload associated with system monitoring. By switching to the tree view, you can easily identify systems where important events have occurred and quickly determine the scope of impact. Furthermore, to ensure that important events are not overlooked, you can filter the display to show only events pertaining to a particular monitoring target. To check whether the entire system is running normally, you can monitor a variety of logs, such as Windows event logs, Linux and UNIX syslogs, and application logs, in a single window. When large numbers of events are issued, the events are aggregated in the display. By filtering these events, for example, based on their associated hosts or severity levels, you can further narrow down the displayed events to find those you are looking for, and then send notifications to the relevant people in a batch operation. 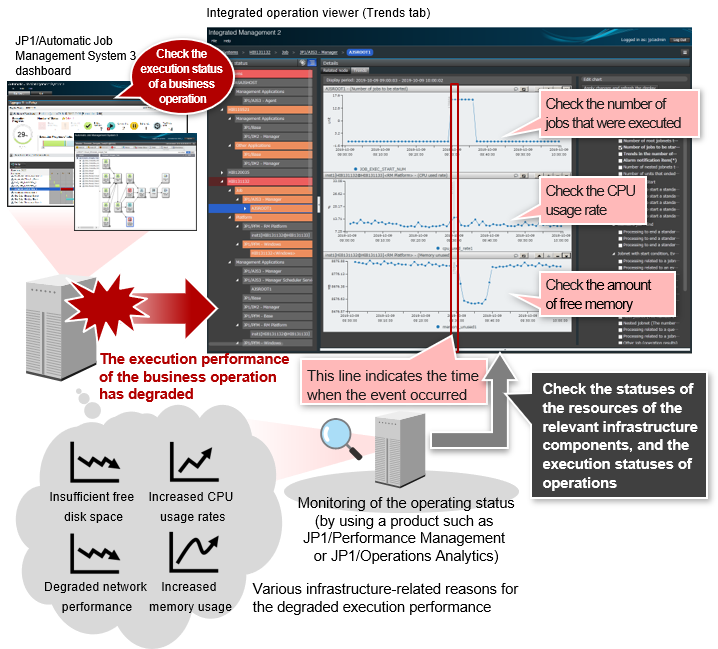 These functions help prevent important events from being overlooked, and improve the efficiency of monitoring operations. During an event storm (a large number of events occurring at the same time), the events are aggregated in the display. This helps ensure that important events are handled, and prevents automatic actions, such as the sending of email notifications, from being performed multiple times for duplicate events. You can also suppress the forwarding of events from a host to the integrated manager, thereby minimizing the overall impact of an event storm on your monitoring operations. You can configure certain actions, such as the notification of operators and log collection, to be automatically executed when a trigger event occurs. JP1 allows you to check the execution statuses and results of such actions on-screen, and to re-execute or cancel actions as needed. You can even temporarily suppress the execution of a particular action or set of actions. In the event of a failure, JP1/Integrated Management 2 displays pre-registered information about the people in charge of investigating the failure (such as their names and contact information) and troubleshooting procedures. This enables operators to carry out the initial response quickly and appropriately. 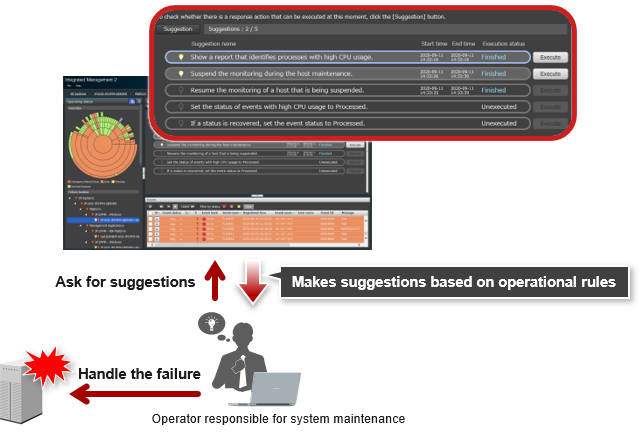 By using this on-screen guidance, you can save the time and the effort it would otherwise take to find the necessary information, and also ensure that all operators handle failures in the same way. 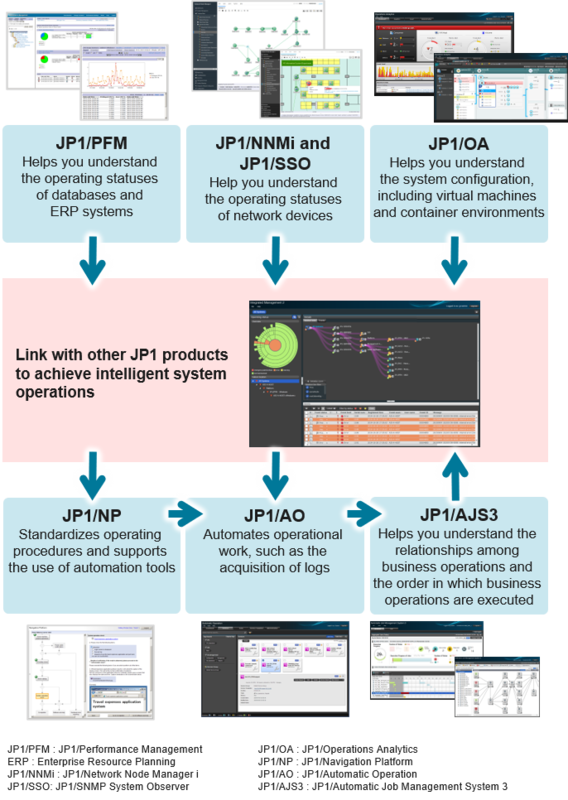 By linking JP1/Integrated Management 2 with other JP1 products, you can streamline the entire series of monitoring processes, from system monitoring to the investigation and resolution of system failures. For example, when JP1/Integrated Management 2 is linked with JP1/TELstaff AE Professional Edition, operators can be notified of detected events via warning lights, emails, phone calls, or other methods. Through linkage with JP1/Navigation Platform and JP1/Automatic Operation, you can graphically display the procedures for handling failures that occur in your system and even automate steps in those procedures. Unifying the way failures are handled helps eliminate reliance on the skills of individual operators.